Poverty in the suburbs: Places that thrived in the era of two-parent families are struggling today. Places that thrived in the era of two-parent families are struggling today. 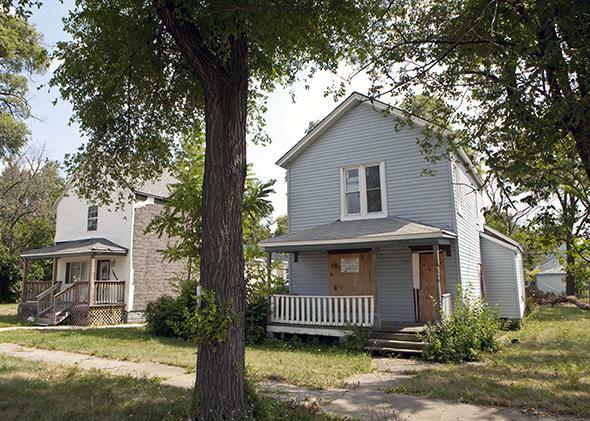 A foreclosed single-family home, its windows boarded up, sits for sale, on Aug. 19, 2013, in Harvey, Illinois. Harvey is a depressed suburb of Chicago that has been hit even harder by the sluggish economy. Buildings all over town are boarded up, both homes and businesses. When I was a small child, something called “the suburbs” kept snatching away my friends, like a monster hiding under the bed, but worse. Over time, I’ve come to appreciate why my friends moved. The urban neighborhoods of my Brooklyn youth were a little rough around the edges, and they didn’t offer growing families much in the way of elbow room. I couldn’t fall asleep without the sweet sound of sirens blaring, but not everyone felt the same way. The suburbs have long been a welcome refuge for families looking for a safe, affordable place to live. But for many Americans, the suburbs have become a trap. This week, Radley Balko of the Washington Post vividly described the many ways bite-sized suburban municipalities in St. Louis County prey on poor people. Towns too small or too starved of sales tax revenue to sustain their own local governments stay afloat by having local law enforcement go trawling for trumped-up traffic violations, the fines for which can be cripplingly expensive, and which only grow more onerous as low-income residents fail to pay them. Those who can afford lawyers know how to massage a big fine into a smaller one. Those who can’t dread their run-ins with local police, who often come across less like civic guardians and more like cash-thirsty pirates. The resentment and distrust that follows is, according to Balko, crucial for understanding the recent unrest in Ferguson, Missouri. Could it be that the problems plaguing St. Louis County reflect a larger failure of fragmented local government? Would these problems go away if, say, St. Louis simply absorbed all of these petty fiefdoms? I doubt it. The deeper problem is that the low-density suburbs of single-family homes that are common in this part of Missouri, and indeed across the country, are fundamentally inhospitable to those who find themselves at the bottom of the economic ladder. You might be wondering why poor families are moving to the suburbs in large numbers—the number of suburban poor grew more than twice as quickly as the number of urban poor between 2000 and 2011—if they are such hard places for poor people to get ahead. Part of it is that as middle- and high-income households moved to the suburbs, the low-wage workers who look after their children had little choice but to follow. Then there is the fact that as America’s most productive cities experience a revival, gentrification is displacing low-income families to outlying neighborhoods and towns. Before we can understand what makes some suburbs so miserable, we first have to understand what makes others succeed. The most successful suburban neighborhoods fall into two categories. First, there are the dense and walkable ones that, like the most successful urban neighborhoods, have town centers that give local residents easy access to retail and employment opportunities. These neighborhoods generally include a mix of single-family homes and apartment buildings, which allows for different kinds of families and adults at different stages of life to share in the same local amenities. The problem with these urban suburbs, as Christopher Leinberger recounts in his 2009 book The Option of Urbanism, is that there are so few of them, and this scarcity fuels the same kind of gentrification that is driving poor people out of successful cities. The other model for success can be found in sprawling suburban neighborhoods dominated by households with either the time or the resources to maintain single-family homes and to engage in civic life. As a general rule, the neighborhoods in this latter category don’t allow for apartment buildings or townhomes on small lots. They implement stringent local land-use regulations that keep them exclusive, and they attract families that tenaciously defend the character of their neighborhoods. There are many differences between these two models. But the most important one is that denser suburbs can accommodate family diversity relatively well while sprawling suburbs simply can’t. Living the low-density lifestyle requires that you either be rich in money or rich in time and skill. Think about it this way. The typical postwar suburb was built to meet the needs of two-parent, single-breadwinner families. They were full of single-family homes that were rarely built to last, and their chief amenity was privacy, which generally meant a decent-sized lawn. Maintaining these houses was a heroic endeavor, but the division of labor implied by two-parent, single-breadwinner families meant that it was not an impossible one. Indeed, the very fact that maintaining these homes was such a chore made them precious to their owners, for whom they were a store of wealth as well as a place to live. Last summer, Slate contributor Matt Feeney argued that Detroit, his hometown, had declined so dramatically because it was “a virtual monoculture, residentially speaking—a city of detached, owner-occupied, single-family homes.” Feeney describes the many ways Detroit, which grew up in the age of the automobile, is unique. Yet many aspects of his diagnosis apply to many other American cities. Threats to property values were not taken lightly, a fact that helps illuminate why fights over court-ordered desegregation and demographic change more broadly proved so ferocious so often. Renters might react to demographic change with relative equanimity, knowing that even if it had negative consequences, it wouldn’t endanger their biggest investment. Homeowners felt they couldn’t afford not to panic. Balko describes an eerily similar dynamic in the St. Louis suburbs, with eerily similar results: round after round of white flight, each one of which leaves a suburban ghetto in its wake. Since the initial rise of the suburbs, families have changed. Married couples with children have fallen from 42.9 percent of all households in 1940 to 20.2 percent of all households in 2010, while married couples without children have fallen from 33.4 to 28.2 percent of all households. Single-parent families have also increased, of course, from 4.3 percent to 9.6 percent. The most dramatic change has been the steep increase in one-person households, from 7.8 to 26.7 percent of the total. Families have also been transformed by rising female labor force participation, with women now serving as the sole or primary wage earner in four in 10 U.S. households with children. In the years before the intelligence and creativity of women were being harnessed by employers, much of it had been devoted to keeping neighborhoods livable and safe. Underemployed men have not, suffice it to say, stepped up to fill this role. Viewed through this lens, the problem we face is clear: Much of our built environment still bears the imprint of the postwar era, despite the fact that the families that were characteristic of that era are no longer dominant. A single-family house built for a mother, a father, and a pair of kids is not a terribly attractive option for a single adult, nor is it affordable when we factor in the cost of upkeep. Such a house might be more appealing to a working single parent, who might welcome the space, yet he’d either have to carve out the time to maintain his little slice of heaven, or he’d have to earn enough to outsource the work of doing so. And then there is the small matter of affording an automobile, and the inevitable traffic fines that come with it. Late last month, Charles Marohn, an engineer and urban planner, wrote an essay on Ferguson that centered on, of all things, the bleakness of its many parking lots and the monotony of its buildings. One of Marohn’s central arguments is that it is far easier to finance the maintenance of a street that serves, say, multistory buildings with retail shops on the ground floor and apartments above than it is to finance a cul-de-sac that serves a small handful of houses, as the former generates far more revenue. To be sure, if the cul-de-sac links together million-dollar homes in pristine shape, this problem is not a problem at all. If it instead serves families that struggle to maintain their homes, or houses that are abandoned, the problem can get ugly fast. Roads need upkeep. Upkeep costs money. If property or sales taxes aren’t enough to pay for upkeep, you can take on debt, you can ask for money from the state or federal government, or, like cities across St. Louis County, you can find creative new ways to leech away cash from your most vulnerable citizens. There is no straightforward way out of this suburban trap. It certainly wouldn’t hurt to welcome more housing development in expensive cities, or to discourage unsustainable development by at the very least not subsidizing it. But the first step toward solving this suburban crisis is recognizing that it is in fact a crisis. Just ask the people of St. Louis County.